(a)	Describe the principal features of the nuclear model of the atom suggested by Rutherford. (ii)	why most of the alpha particles pass through the foil without any significant change in direction. Q2. In an experiment to investigate the structure of the atom, alpha particles were aimed at thin gold foil in a vacuum. A detector was used to determine the number of alpha particles deflected through different angles. (i) In which direction will the number of a particles per second be a maximum? (ii) State what this result suggests about the structure of the atoms in the metal. (b)	A small number of alpha particles are scattered through 180°. Explain what this suggests about the structure of the atoms in the metal. 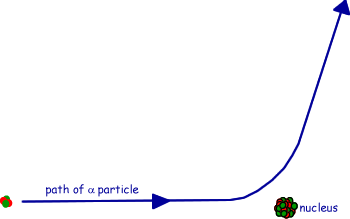 (c)	The figure shows the path of an alpha particle passing near a nucleus. (i)	Name the force that is responsible for the deflection of the alpha particle. (ii)	Draw an arrow on the diagram in the direction of the force on the alpha particle in the position where the force is a maximum. (iii)	The nucleus is replaced with one which has a larger mass number and a smaller proton number. Draw on the diagram the path of an alpha particle that starts with the same velocity and position as that of the alpha particle drawn. (i)	Why is it necessary to remove the air from the chamber in a Rutherford scattering experiment? (ii)	Give two conclusions that can be deduced about the nucleus from the results of such an experiment. (iii)	What force or interaction is responsible for Rutherford scattering? (b)	The figure below shows three alpha particles, all with the same kinetic energy, directed at a nucleus. The path followed by alpha particle 2 is drawn in for you. Draw lines on the figure to show the paths followed by alpha particles 1 and 3. Q4. 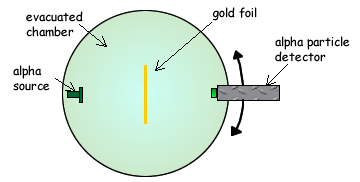 The diagram below shows the apparatus used to investigate Rutherford scattering, in which alpha particles are fired at a gold foil. (a)	Why is it essential for there to be a vacuum in the chamber? (b)	What observations made with this apparatus support each of the following conclusions? No explanation is required. (i)	The nuclear radius of gold is much smaller than its atomic radius. (ii)	Most of the mass of an atom of gold is contained in its nucleus. (c)	The drawing below shows alpha particles incident on a layer of atoms in a gold foil. Copy this figure draw the complete path followed by each of the alpha particles shown.